A historical village that Bali Aga people live, "Trunyan Village" is located by the lake and is known as having "aerial burial" culture which only a few areas of Indonesia do. A name of the village has meanings of Trun = Tree and Yan = aroma. Since the dead bodies are left under an aromatic tree, it does not have a smell of decay. In Trunyan Village, dead body doesn’t burn or buried but only placed in the graveyard. 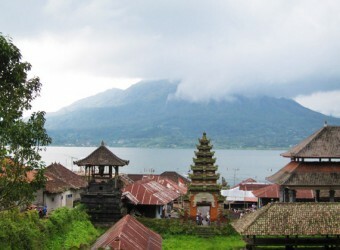 The village is located on the bank of Lake Batur and only accessible by boat, but now the village can also be accessed by car. I enjoyed boat ride to the village while viewing the mountain scenery. First, I visited the village. I thought that there are many Trunyan villagers are mild-mannered person. They greeted me with smile. The cemetery is also only accessible by boat from the village. There is a graveyard to place dead bodies about a few meters from the place of getting off the boat. Here I could view skeletons aligned on top of the stone steps. And dead bodies are laid next to them. The dead bodies are covered with a kind of wooden fence and will not stink out. Trunyan villagers believe that Taru Menyan trees absorb the bad smell of the corpses. Mysterious…I recommend you visit this village if you want to see the unique custom of Trunyan Village.